The aim of this study was to compare perioperative results of robotic IPOM (r-IPOM) and robotic TAPP (r-TAPP) in ventral hernia repair, and to identify risk factors associated with postoperative complications. After obtaining balanced groups with propensity score matching, the comparative analysis was performed in terms of perioperative and early outcomes. All variables were also examined in a subset analysis in patients with and without complications. Multivariable regression analysis was used to identify independent risk factors associated with the development of complications. Of 305 r-IPOM and r-TAPP procedures, 104 patients were assigned to each group after propensity score matching. There was no difference in operative times between two groups. Although postoperative complications were largely minor (Clavien–Dindo grade-I and II), the rate of complications was higher in the r-IPOM group within the first 3-weeks (33.3% in r-IPOM vs. 20% in r-TAPP, p = 0.039). At the 3-month visit, outcomes between groups were not different (p = 0.413). Emergency department re-visits within 30-days and surgical site events were also higher in the IPOM group (p = 0.028, p = 0.042, respectively). 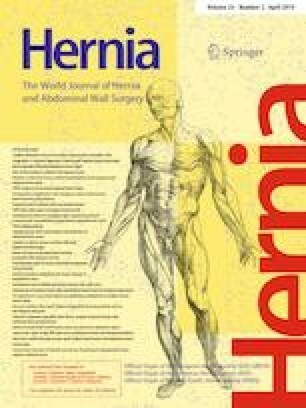 In regression analysis, the development of complications was associated with incisional hernias (p = 0.040), intraperitoneal mesh position (p = 0.046) and longer procedure duration (p = 0.049). Our data suggest r-IPOM may be associated with increased complication rates in the immediate postoperative period when compared to r-TAPP. However, at 3 months, outcomes are comparable. More investigation is needed in this area, specifically with regards to long-term follow-up and multicenter data, to determine the true value of extra-peritoneal mesh placement. The authors would like to thank Dr. Elif Gokcal for helping us with this study. Drs. Gokcal and Morrison have no conflicts of interest or financial ties to disclose. Dr. Kudsi receives teaching course and/or consultancy fees from Intuitive, Bard, Medtronic, Gore, Optecks, Medrobotic, outside the submitted work. The Institutional Review Board approved this study.